Tour de Farms participants listen as Kynan Kelly describes a misting system he uses to increase humidity in his East Sixth Avenue garden. 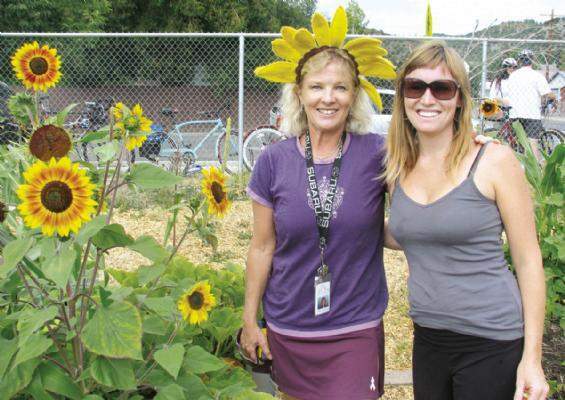 Kelly’s backyard garden was the last stop on the in-town ride of Tour de Farms on Sunday. A Sunday morning bike tour of the city's backyard gardens was a moveable feast: a strawberry here, a string bean there, a ripe cherry tomato for dessert. The organizers of the third annual Tour de Farms Bicycle Ride probably didn't want the 40-plus participants grazing at each stop, but a certain writer couldn't keep her hands to herself. Fresh, local food at the peak of the season is just too tempting. 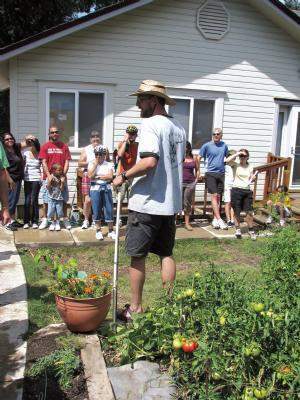 The tour, organized by Julie Hudak and Jeanine Justice of Healthy Life-style La Plata, was designed to encourage that mouthwatering enthusiasm for gardening, and let participants see, touch and (secretly) taste the area's bounty. 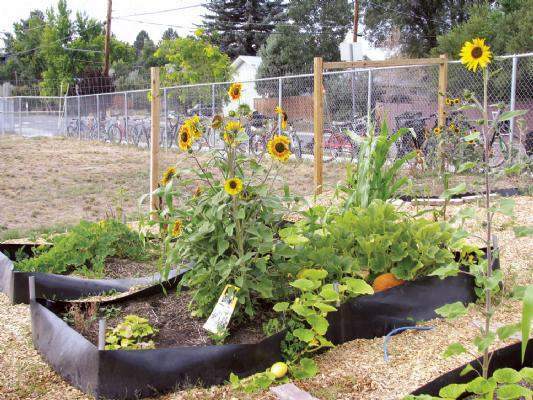 "We want to celebrate the local food production in our urban area, within the city limits," said Katy Pepinsky, an event volunteer and coordinator of Durango's Operation Frontline. This year's carbon-free rides focused on backyard food production to give riders ideas about what they could grow at home. A five-mile, in-town ride began and ended at the Smiley Building, and a second 25-mile bike ride toured farms around Ignacio at the same time. Both tours ended with a local-food barbecue supplied by farms and area restaurants. The first stop on the in-town ride was the Needham Elementary School Garden. The 1-year-old fenced plot on the west edge of the playground has raised beds bursting with creative combinations of vegetables and flowers. Needham parent volunteer and garden coordinator Julie Beekman said children in each grade last fall designed their own beds. They experimented with seed balls and "three sisters" - Native American plant-ings (squash, corn and beans). Nora Stafford, a first-grade teacher at Needham, said the children become voracious grazers when they enter the garden, snacking on tomatoes, beans - even chives. "We had to rein them in so there would be something to show for the tour," she said. Over the summer, a volunteer garden club watered, weeded and harvested the early crops, and delivered bags of produce around the neighborhood. In the next few months, the late-season crops will be harvested and used in the school's lunch program, Beekman said. Darcy Craig of The Garden Project worked with the school to get the garden started last year. "Our mission is to educate, and we work with teachers to integrate the garden into their curriculum," she said. 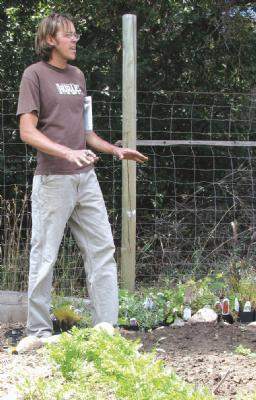 Craig said the garden provides both food and comfort: Stressed or troubled children really respond to working the soil. "It can help heal children and adults. Getting your hands dirty helps slow people down," she said. At the next stop, Rachel Turiel, a Family & Relationships columnist for the Herald, offered a tour of her backyard garden on San Juan Drive. 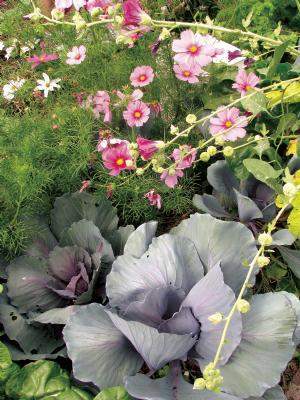 Her raised beds are a colorful chaos of vegetables mixed with flowers. 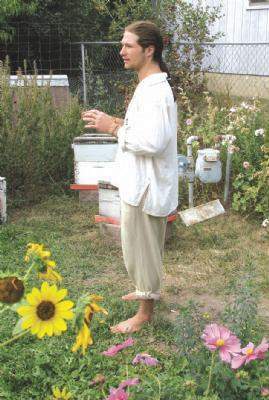 Turiel's backyard also has fruit trees, a greenhouse for seed starting and extending the season, and two beehives maintained by a downstairs resident, Sage Petersen. He talked about colony collapse disorder, and how pesticides threaten honeybee population and health. "These bees are doing well because of the garden," he said. "There's nothing toxic in there." The touring bikers, many of them experienced gardeners, wandered the garden with delight. "Can I have some seeds from your yellow hollyhocks?" one woman asked. "Yes, please. Go forage," said Turiel. Paula Lutz's home garden on Delwood Avenue was the third stop. 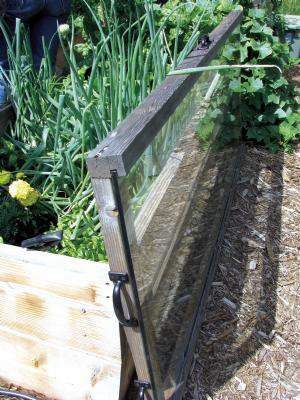 Her orderly raised beds were carefully designed with a deer fence, drip system and season-extending hoops and cold frames. She said she and her husband and co-gardener, Paul, enjoy cooking and eating what they grow. (See her recipes, above. )"But the strawberries don't even make it out of the garden," said Lutz. "We eat them while we're working." Lutz answered questions about pest control of grasshoppers and aphids, and talked about her favorite harvesting tool, a hori-hori, or Japanese soil knife. After a short hill climb, the tour stopped next at Manna Soup Kitchen. The 5-year-old garden adjacent to the kitchen supplies supplemental food for meals. "But it's not oriented to massive food production," said Jason Morrow, a volunteer for The Garden Project who works on Manna's garden. "It's more about awareness of local food and food security." Volunteers take care of the garden, including Upward Bound students and some of the people who eat meals at Manna. At the last stop on the tour, Kynan Kelley and his father, Reese Kelley, whom he calls "the patriarch of the plot," welcomed bikers into their adjoining backyard gardens on East Sixth Avenue. The site features century-old raspberry bushes, tiered beds with fist-sized red tomatoes and fruit trees. The father and son rib each other about the size of tomatoes in the side-by-side lots. "We have a little competition to see who can grow things better," said Kynan Kelley. "He's got more sun; it's not fair," said Reece Kelley. The Garden Project welcomes volunteers and supplies for Needham Elementary School Garden, Manna Soup Kitchen and other community gardens. For more information, visit Click here. 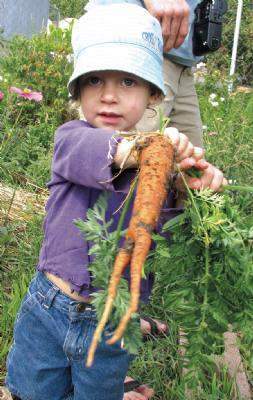 CSU Extension is offering a 2009 Backyard Food Production series this fall. 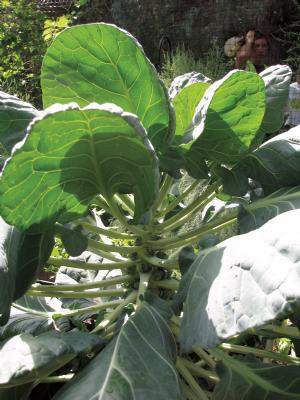 The goal is to encourage small-scale and backyard gardeners to grow and eat their own food. Classes will be held from 6 to 8 p.m. Mondays and Wednesdays from Sept. 28 through Nov. 4. The series will be taught by CSU extension office research personnel, as well as local experts. The cost is $120 ($10 per class). Early registration is recommended, because the class will be capped at 40 students. Call 382-6464 to register. Healthy Lifestyle La Plata, in cooperation with Colorado State University La Plata County Extension Office and the Durango Farmers Market, will host the final cook-off of the second annual Durango Iron Horse Chef Competition from 9 a.m. to 12 p.m. Saturday, The competition pits two chefs against each other and against the clock. 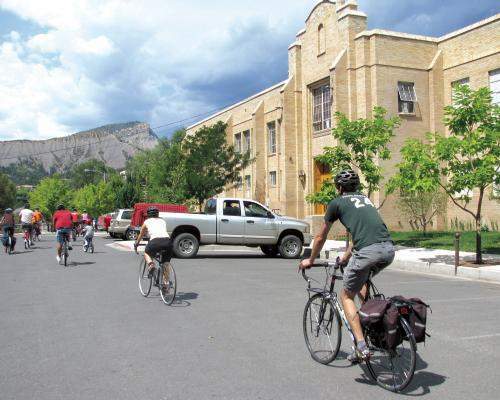 The chefs have an hour and a half to shop and prepare dishes – all at the Durango Farmers Market, located in the parking lot of First National Bank of Durango (Eighth Avenue between Main Avenue and Camino Del Rio). The first semifinal took place July 25, with chef Sean Devereaux of Guido’s Favorite Foods barely beating out Paul Spadora of The Palace Restaurant. During the second semifinal Aug. 15, Ryan Lowe of The Ore House defeated Jason Blankenship of Kennebec Café. The final showdown Saturday will be between Lowe and Devereaux. The public is invited to participate in a discussion of how the community can take ownership and control of the local food system. This discussion will take place at the City Council Chambers from 5:30 to 7:30 p.m. Sept. 10 as part of the Sustainability Alliance’s La Plata Sustainability Dialogue. There will be a chance to discuss what local "ownership" might look like, and how to achieve it. An immediate outcome of this discussion will be providing input on local food goals to the County’s Comprehensive Planning process later this month.